Little Studio is a boutique exercise studio located in Stellenbosch. We are devoted to excellence as we assist our clients in their journey toward optimum health and wellness. In a supportive atmosphere we inspire growth, change and well-being through movement. Certified, mindful instruction is offered in an inviting, calm environment. Years of training, continuing education and teaching have made us the dedicated professionals we are, able to give you this quality experience. Private, duo and group classes include Mat, Barre and Yoga for all levels. We also offer specialised classes for rehabilitation, athletic performance, de-stressing, pre- and post-natal, children, elderly and otherly-abled bodies. We value quality over quantity, which is why we focus on private sessions and small group classes limited to five people. This personalised approach means you get more individual attention from the instructor, making sure you are in good form, well aligned and safe. Whether your movement is strong or gentle, it can come from a centred and connected space. We aim to deepen the bodymind connection through movement that is mindful and free of tension. Through movement, we find heath. We can learn from a regular movement practice how to manage our lives from a healthy connection to our bodymind. "CHANGE HAPPENS THROUGH MOVEMENT, AND MOVEMENT HEALS"
Fran Siebrits, owner of Little Studio, is fascinated by human movement. She has trained in numerous body and mind techiniques to better understand our human ways. As an experienced and skilled practitioner and teacher, Fran has a keen eye for detail and a deep understanding of anatomy and movement mechanics. She understands the importance of conveying concepts clearly and accurately (a crucial component of effective teaching) while recognises each persons individual needs. Among others, her qualifications include BASI Mat Pilates, CME Equipment Pilates, Advanced 500hr Yoga, Pre-and Post Natal Yoga & Pilates, Budokon Yoga, Aerial Flying Movement, Myofascial Release & Trigger Point Therapy, Massage Therapy, Mindfulness Training, Breath-work, and Endurance Running Training. Fran is passionate about teaching, is continuously learning, and remains inspired with creative strategies to improve the experience of her clients. Movement has always been a core aspect of her life. She offers specialised classes in mindful movement, athletic performance, pre- and post-natal, rehabilitation, group exercise, as well as mentorship programmes, wellness retreats, and yoga teacher trainings. Ji Eun is originally from South Korea. She was an English teacher before falling in love with Pilates and South Africa. Her classes focus on precision and strength, combining focus and concentration whilst still having fun. Her passion for Pilates and each individual's progress is evident in the way she assists and adjusts throughout her classes. Lente has been practicing Pilates and Yoga since the age of 15, and has been a dancer most of her life. Qualifying as an instructor naturally followed. 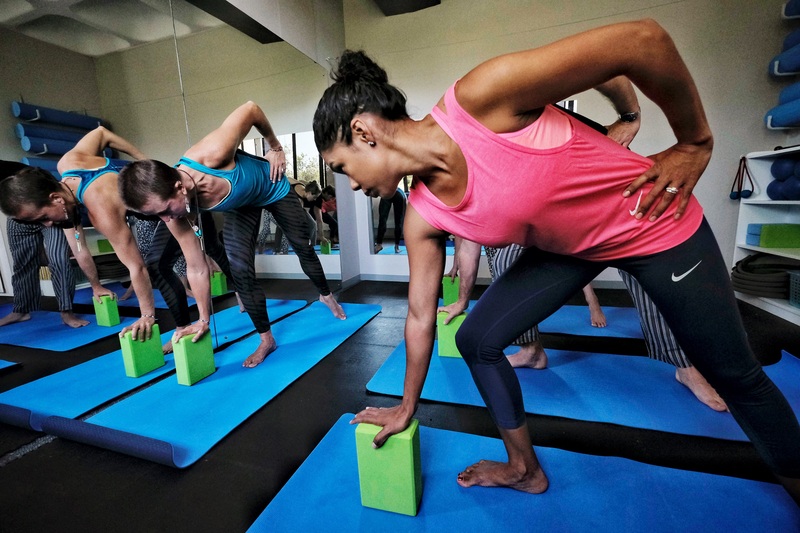 With a focus on precision, core strength intelligence, creative sequencing, breathing and mindfulness, you will leave her class feeling light at heart and heavy in the core. Melanie has been doing yoga since her school days and since qualifying as an instructor hasn't looked back. Her passion is to spark inner exploration and to share the transformative potential of yoga. She focuses on the elements of stength, felxibility and balance, awakening a connection to our bodies and minds. Package bookings are per calendar month, securing your spot in a certain slot. Sessions are 50 minutes each. All ages, body types and fitness levels are welcome. There is a 10% discount for a 3-month package commitment. Sessions are to be used within the month booked. Package payments are to be made in advance, either cash or EFT. There is no refund on purchased packages or gift sessions. If a session is cancelled before 24 hours and no rescheduling within the month is possible, 50% of the session will be credited for the next month, if organised within the current month. If the session is cancelled within 24 hours, the session cannot be rescheduled or reimbursed. Sessions cannot be transferred to another person.